Last Wednesday I started at The Department of Computer Science at The University of Aarhus. Next Monday the University courses start for real, so I guess I should prepare to kiss my spare time goodbye. I've started writing a tutorial series about one way to create a simple tile based game engine. I'm pressed for time right now, so the tutorial is far from finished, but I'll be updating it when I find some time. You can see what I've made of the tutorial so far by following the link below. The source for WikiAdventure is now available. I promised that the release of WikiAdventure would be acompanied by a complete game, but lately I've lacked the motivation so it won't be available now. Maybe I'll write it sometime later. The download will be available 14 days. Finally my WikiAdventure project is ready for a public beta! A few people have tested it already, and it ought to work cleanly on most computers. However, I use some Windows-only API function so I doubt it will work on Linux systems. Please download it, test if it works on your computer and tell me what you think of it. B toggles the debug menu. All the data used for the games can be view and edited here. If the beta testing goes successfully, I'm going to start working on a larger game based on it. Tonight WikiAdventure has been released for beta tested by a small hand picked group. Actually it was one person, but it sounded nice didn't it? [20:38:24] Anders: What's your specs? [20:43:42] Anders: Okay, first up - can you run it? So there were a bit of trouble at first with some missing DLL's because he's running Windows 2000. A few DLL's were exchanged and that was fixed. Now the game started up correctly, but crashed when it started downloading data. We tried finding out what caused this problem, but then suddenly - probably caused my some divine interference - it worked like a charm! Legs up, a nice warm cup of coffee and a good book. Weekend time is here! I have about 15 minor things on my to-do list for WikiAdventure, so it won't be long before a beta is released. I have to be social tonight and tomorrow but I hope to have it released by Sunday. I just had to share this quote with you. "I can imagine a world without hate, a world without fear, a world without war. And I can imagine us attacking that world, because they would never expect it." 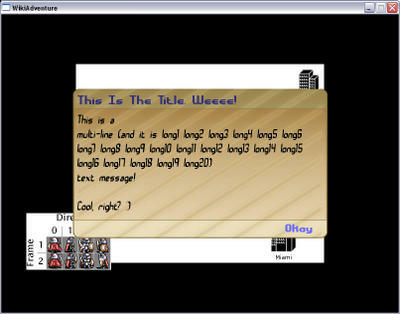 In roughly 100 lines of code, I've added a graphical in-game message box. The title and message text is passed as arguments, and the background image can be switched out by the individual games. If the background image is different in size then the text aligns to fit the image. Yesterday I implemented a "load/save game"-system in WikiAdventure. It's actually really more of a "continue game/don't continue game"-system, but that's beside the point. Anyway, I'm using the Lua scripting language for in-game scripting, so I have no idea which variables will be created and which to save etc.. Tricky you say? Yes, but I did it, and I'm not selfish, so I'm going to share my incredibly complex algorithms with you. The Game Programming Wiki One Year Anniversary! Visit The Game Programming Wiki. Now I've only got 9 working days left until I quit my job. I can't wait! Then almost two weeks off awaits followed by me starting on university.